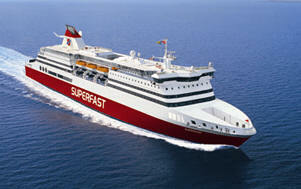 Superfast Ferries is considered to be one of the best Companies operating in the Adriatic Sea. It offers fast and confortable crossings between Italy and Greece all year round, with new ferries. The Bari - Igoumenitsa - Patras line is operated every day both from Bari and from Greece. Departures from Bari are every day at 20.00 except on Sundays when departure is at 01.00 pm. Departures from Greece are scheduled every day from Patras at 06.00 pm and from Igoumenitsa at midnight. During summer time Superfast calls also at Corfu port. Ferries Superfast I and Superfast II have a large open garage where camping on board is allowed. You can book your ticket to Greece with Superfast through our on-line reservation system and get the best available price for your voyage. For any further information feel free to contact our reservation department (+39 0836 801578) or send us an e-mail (info@elladeviaggi.it)!